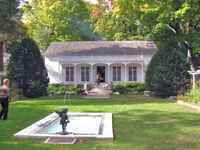 Gilbert worked on the design of Cedarhurst, the country estate of Cordenio A. Severance and his wife Mary Frances Harriman Severance, for several years. The original farmhouse on the site dates from the late 1860s and was built for Charles O. Fanning. It was expanded in 1886 to serve as a summer residence. The house was inherited by Mrs. Severance, Fanning's granddaughter. The original farmhouse survives as part of the existing structure and houses the kitchen. Gilbert expanded the building to its present size between 1911 and 1917. The 100-foot long front facade, facing an equally impressive lawn, features massive pedimented porticoes at each end, evoking a grand English country house. 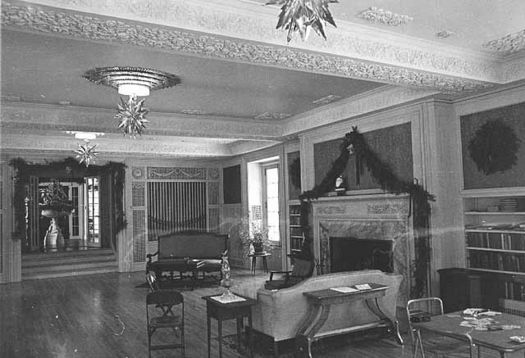 Among the well-preserved interior spaces is the grand ballroom wing which includes a pipe organ and three fireplaces. 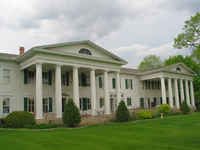 The grounds of the ten-acre property are intact and include a walled rose garden and agricultural buildings. Severance, a lawyer active in civic affairs, was a friend and longtime client of Gilbert. This is the third project that Gilbert is known to have designed for him. The other projects were the interior of his home at 589 Summit Avenue (1888) and a clubhouse (1891). Severance was president of the American Bar Association between 1921 and 1922 and a co-founder of the American Law Institute in 1923. Many notable political figures, including Presidents Theodore Roosevelt, Warren G. Harding, Calvin Coolidge, and William Howard Taft, visited Cedarhurst. The building was listed on the National Register of Historic Places in 1976. In recent years, it has served as a conference center and banquet facility. Samuel H. Morgan. “Timber. Steel, Law, and Politics: St. Paul’s Pioneering Attorneys and Their More Interesting Cases.” Ramsey County History 33 no. 4 (Winter 1999): 4-13.